The Defender legend lives on in this perfectly balanced fusion of classic features and modern luxury. A Ruskin Inside™, diamond stitched interior gives this station wagon an air of superior quality, matched with quintessential Land Rover style. Raised Defender lettering and an original Solihull badge are proudly emblazoned across the bonnet and rear of this deep green 110, accompanied by an array of Satin Black accents. 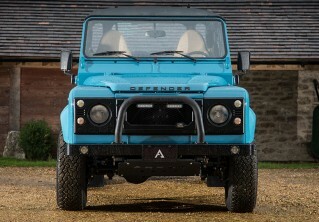 Just like its namesake, this Defender is the embodiment of strength and fortitude; a king amongst off-road vehicles. Arkonik has taken an iconic truck and built it to the standard it deserves to be. Check out GRYPHON D110 Edition here or contact us for more information.